On board we feasted on Air Asia's pay as you go menu of biscuits, instant coffee, tea and noodles. Air Asia exclusively fly old Boeing 737-200 aircraft. They have just placed an order with Airbus for 50 new aircraft. Now we can't really complain about Air Asia, they made our holiday possible with a great A$170 Denpasar - Kuala Lumpur return fare. Other airlines charge up to A$400 for the same flights. We landed at Kuala Lumpur International Airport (KLIA) at around 7pm. Took the A$3 public bus on the 79 km 1 hr ride to the city. Then the Light Rail (LRT) to China town where we booked into the A$30/night China Town Inn. Jamal's younger brother came down from Bandung to look after the KHO while John and Jamal went on holiday to Malaysia. While we were away he repainted the roof of the KHO. He returned with Jamal to Bandung days after our Malaysian return. down with brother Deni on the 25 hour, $30 bus. Jamal chose to return by train, a little more expensive, 28 hrs, but "more comfortable" said Jamal. there. Ines accompanied him a few days before the July1st school year began to help find him some affordable accommodation in the northern Woodlands area near the Singapore school. Well known American globetrotter Allan Zeroworkski who lives between California, Myanama, Thailand an Nepal, was in town for a few days to catch up with friends. Allan's visit coincided with Andi's farewell dinner at the very popular Warung Italy in Seminyak. Ines in rubber boot mode, as Allan tells of his latest meeting with the King of Nepal. "Nice warm and wonderful guy", Allan assures us. with friend Geoff, where he spent a night in a Spanish jail after illegally entering Switzerland. He didn't realize Indonesians need a visa. While Jamal was in Bandung, John busied himself between dinners, renovating the KHO kitchen to a colonial version of the modern stainless steel look. The first job was to remove and cover over the passive air vent and install an electric exhaust extractor. The entire cement bench top area was covered with shiny metal. June 29: David Booth, the founder of the East Bali Poverty Project (EBPP), has recently returned to Bali after a trip back home to the U.K. where at Buckingham Palace where he was invested with the MBE Award. David is a MBE recipient in The Queens 2004 Birthday Honours List for "Services to sustain development in rural East Bali, Indonesia." Bali: The Java-Bali electrical power grid is suffering a sudden and severe shortfall in power generating capabilities – estimated at between 77 – 328 megawatts. Officials say will persist until late June 2005. The power crisis has been brought on by repairs currently being carried out on gas supply pipes feeding the Muara Karang and Tanjung Priok Steam Generating Plants in Java. These repairs have put added strain on a power supply system already operating at near maximum levels. Most major hotels in Bali and Java and many places of business already have back-up emergency power generation systems in place to ensure uninterrupted power supplies to their customers. The Indonesian government has announced that 13 countries in Europe and the Middle East may obtain a visa-on-arrival (VOA) in an effort to attract tourists to the country amid terrorism fears. The new countries are, India, Saudi Arabia, Kuwait, Belgium, Spain, Portugal, Russia, Egypt, Austria, Ireland, Qatar, Greece and Luxembourg. Still the Netherlands and Sweden were not included, though due to be for security reasons. This announcement has yet to become law, if in doubt check with your Indonesian Embassy before travel. Microsoft, is to grant Indonesia an amnesty on pirated versions of its Windows program used on government computers in exchange for a token payment of US$50,000. In exchange, Indonesia would promise to purchase authorized MS merchandise and launch a major crackdown on a pirated software racket that is one of the world's worst. President Susilo Bambang Yudhoyono (SBY) called for firms to buy ships manufactured locally to help save on foreign exchange, at a ceremony for the hand over of the 30,000 DWT, Fastron tanker from state shipbuilding company PT PAL to state oil and gas firm Pertamina in Surabaya, the tanker is the biggest ever built by PT PAL. A Garuda Bali to Japan Flight encountered mid-Air turbulence on Wed, June 1, 2005. The Airbus A330 aircraft carrying 161 passengers and 14 crew encountered mid-air turbulence while on a long final approach to Kansai International Airport. 5 pax and 5 crew were injured. police chief said that "we are not just blindly catching the small suspects and the petty offenders." Only Dopes Bring Dope to Bali. Despite calls for Australians to boycott Bali, airline Garuda Indonesia on Wednesday announced an extra weekly flight between Australia and the popular tourist island to cope with increasing demand. Australia's Northern Territory Cricket and the International Cricket Council have announced a cricket development partnership with the Indonesian Cricket Foundation (ICF). Indonesia will be assisted with, coach education courses, administration and strategic planning advice. The partnership will compliment the Western Australian Cricket Association (WACA) staff in Indonesia. Indonesia has made exciting progress in cricket development with playing numbers growing from 300 in 2000 to almost 11,000 in 2004. Indonesia will compete in the EAP Cricket Cup tournament in Vanuatu in late September. Indonesian domestic carrier, Mandala Airlines, owned by the Army Strategic Reserves Command (Kostrad), is planning to fly to Spain in line with the improving performance of the private airline. Mandala Airlines currently operates 15 Boeing 737-200 Advanced which require a relatively short runway and are thus uniquely suitable for Indonesian conditions. The airline has 5 new aircraft on order. Feb 12, 2005, Mandala Airlines B737 runs off the runway in Semarang, Java. The aircraft was carrying 30 passengers, none were injured. The aircraft is repairable, only suffering a broken nose wheel. Every year during rainy season Indonesia suffers many runway overrun accidents due to aircraft aquaplaning on flooded runways during heavy rain. Many airports in Indonesia have sub standard runways, originally designed to take a Folker Friendship aircraft. When an aircraft touches down it is only a few kilo's over weightless, if the runway has a layer of water the aircraft can aquaplane on the water extending it's landing run - not desirable when the runway length is critical. Pilots of the new Low-Cost carriers are often put in a dangerous circumstances, forced to land in stormy conditions in order to maintain the extremely tight flight schedules demanded by the carriers. Aircraft utilization is one of the key factors in reducing cost. In KL we always stay right in the heart of China Town. China Town is the life of the City, runs non-stop 24 hours selling anything you may want or not want. of course fake watches. John bought himself a fake Brietling Aviation watch. Just A$5.57. Since we were last in KL they have now built a turbine ventilated roof over the market street. Quite an impressive structure, some 400 meters long it runs the full length of Jalan Petling. The canopy protects all the street stalls from the daily afternoon tropical downpour. It took 2 years to construct and I'm sure cost a fortune. The sellers must have a good political lobby group. After a few cocktails we headed around the corner from our hotel for dinner a'l fresco at the Pavilion, one of the myriad of street eats that spill out to the closed street. Next morning off to the Swiss Inn, 2 doors up from our hotel for their great buffet breakfast - all you can eat and drink for A$4.80. The rest of the day was spent shopping. 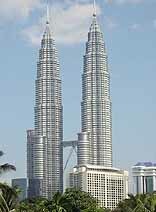 John went looking for bookshops and Jamal went to Little India and the Petronas Tower for yet another look. That night we went to the OLD CHINA CAFE for dinner. The Old China Cafe is like a Shanghai Tea House set in the 1920's complete with 20's crooner music, The place is full of antiques and serves authentic straights Nyonya food and incredible coffee. They serve cocktails and a selection of good imported wines. I had the Nasi Rendang & Jamal Nasi Goring, both excellent. Price reasonable. Next day after lunch we headed out to the Kuala Lumpur airport, for our AirAsia flight to Kota Bahru. The flight as usual was 1.5 hours late when we finally took off. 20 minutes into the flight we did a screaming left turn and the head flight attendant announced we were returning to Kuala Lumpur because the Boeing 737 aircraft had a technical problem. Everybody on board was concerned - Air Asia doesn't exactly have the greatest safety record. I asked the Flight Attendant what was wrong, but she had no idea. However I knew once we sighted the runway at KL and there were no fire tenders, it could not be too serious. Jamal, who hates flying was terrified. Although he became very chirpy after the successful landing. We waited a further 2 hours in KL, while the aircraft was taken away and had a new set of spark plugs fitted. Finally we took off and had an uneventful flight to Kota Bahru arriving at 10 pm. We took a taxi into town and stayed at the Temmengong Hotel . Although Kota Bahru is in the state of Kelantan where they observe Muslim Suria Law - although they stop at hand amputation for thieves and stoning for adulterers, it is a modern, friendly clean city. Planet guide book, to find the only bar in town, up some unmarked stairs on the first floor beside a Chinese restaurant. The Bar was able to obtain the licence to exclusively serve the Chinese community. A sign just up the stairs and another in the bar made it very clear that Muslims were not to enter and would not be served. "Food and Drink not for Muslim"
Kota Bahru has the distinction of being the first place attacked by the Japanese, who landed on a beach near the city two hours before the W.W.II. attack on Pearl Harbour. The Japanese bought Kota Bahru under Thai control for the duration of the war. Subsequently there is an interesting war museum in Kota Bahru with many Japanese weapons, uniforms. 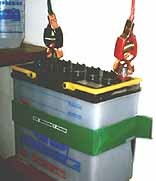 paraphernalia, photo's and displays. By the 1820's Kota Bahru was the most populous and one of the most prosperous in the Malay peninsular. The city has many interesting historical buildings. 3 km taxi ride from Kota Bahru. 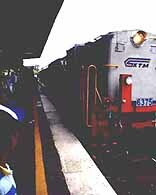 There is a fast night express train to Singapore from Kota Bahru but unsuitable for sight seeing. Before leaving we studied the map and went to the train booking office the day before departure to get an update on the actual train schedules. There are two day trains departing from Kota Bahru, the first at 0600 which goes through to Singapore and a local train at 1330 just to Gua Masang arriving at 1730. We decided to take this train as the 0600 departure would not have been practical. The train was late, which we were told was normal. We finally left at 1430 and arrived at 1900. 4.5 hours for a mere 170 km. The train ticket cost A$2.40. The section to Gua Masang is flat at first, then enters mountain country. The area is dense jungle, the railway being the only communication for villages along the way. The train stops at each village unloading, goods, produce, chickens, pigs and people. Finally we arrive in Gua Masang. The name of the town translates as Gua (Cave) Masang (Civet Cat). The town is surrounded by spectacular lime stone mountains which are full of caves, originally the Civet Cat lived in these caves. After finding a hotel we relaxed with a couple of scotch's from our supply. 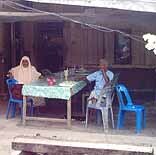 This town is still in the state of Kelantan where under Muslim Law, alcohol is forbidden. We found the best restaurant in town De Maxim's of Gua Masang. The next morning we headed off on the next leg of our journey, 95 km, 3 hours to Kuala Lipis. 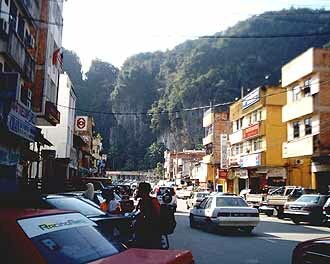 Early in the afternoon we arrived at Kuala Lipis, a surprisingly modern town, after some we had seen on our journey. This was the end of the jungle travel and now we were in the state of Pahang which has slightly more liberal drinking laws, we even saw a bottle shop. they were fully booked out due to the Malaysian School Holidays. Instead we booked into the Jelai Hotel overlooking the Jelai River. 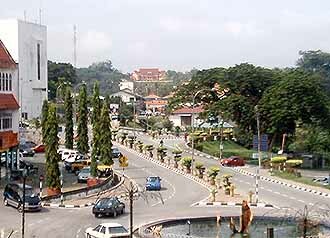 Kuala Lipis is a small town with a strong colonial past and was a gold mining centre long before the British arrived in 1887. Many grand colonial buildings date from this period. The railway came through the town in 1924. Recently many gold mines have been reopened using modern recovery techniques. A few doors up from our hotel we found "Flash Jack's Bar", Jack Teh the owner, was a very wealth man until he lost all his money in the Asian Financial Crisis - his answer was to open this bar, the only one in town. Licensing Laws are strict, he can only open from 6-12pm. We stayed two days in Kuala Lipis, a nice town with friendly people. From Kuala Lipis we took a fast express train through to Singapore, which departed at 0800 and arrived in Singapore at 1800. Before leaving Malaysia at Jahore Bahru, the Malaysian Immigration Officers board the train and stamp travellers passports. Crossing the Jahore Bahru - Singapore Causeway. Note the large water pipes - Singapore has no water of it's own and must import it from Malaysia. On arriving in Singapore at Woodlands everyone must leave the train and go through Singapore Immigration. The operation is surprisingly efficient considering the thousands who cross daily. Although a new bridge has been built traffic is always chaotic on the Causeway especially during the rush hours. With land prices at a premium hotels are very expensive in Singapore often 50% more than you would pay in another city even the YMCA is A$90 per night. 8 hotels in Singapore, they are all reasonably priced. The low price is achieved by the rooms being quite small - somewhat like a European Pension, however all the fittings are first class. Each room has a window, there is an ensuite, air-con, Tv, a hot water jug, water, coffee, tea and instant noodles. Hotel 81 in Geylang is 4 stops (8 minutes) on the MRT rail system from the Central Business District and 15 minutes from the airport. The Geylang area is a predominately Malay area with lots of interesting coffee shops. The first night we headed off to Bugis Street for dinner in an Italian Restaurant - we wre a bit over Chinese food by this time. After breakfast we headed off to Orchid road and later Bugis St for a day of shopping. 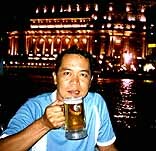 For our last night we headed to the Quay area on the Singapore river, where there are dozens open air restaurants along the quay. Next morning off to the Queen St. bus station and the $1 ride via the Causeway, Singapore and Malaysian Immigration, to Jahore Bahru where we caught a 4 hour express bus to Kuala Lumpur. One afternoon while we were staying in China Town KL, the Police raided the hundreds of stalls in the street market, selling counterfeit watches, handbags and jeans. The stall holders quickly packed up and left in seconds. Fake Rolex's sell for a little as A$4. Empty street after the raid. A few hours after the Police left, all the stalls were open again, however many were being cautious to keep an eye out. The next day we headed to Ipoh by bus, a 3 hr trip on the main northern Highway. On arrival we checked into the Majestic Hotel, which is part of the Ipoh train station, the building is known locally as the Taj Mahal. 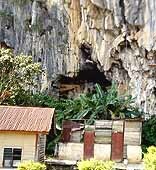 Ipoh was once called the City of Millionaires, made it's fortune from the tin mines in Kinta Valley. Ipoh is renowned for it's grand colonial architecture, much of which has remained to this day. In the Grand Days of the British Empire there were many Majestic Hotels in Malaysia, most either in or adjacent to the city railway stations. 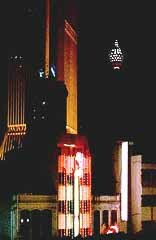 30 years ago I stayed at the KL Majestic Hotel, now sadly gone. The second last remaining Majestic in Malacca closed it's doors three years ago. Kuala Lumpur and Butterworth and after completion they plan more train services to attract tourism to the area. The Irony is that there are only two trains a day, the KL train departing at 0150 and the Butterworth train departing at 0113. They plan to renovate the Majestic Hotel interiors when the station is completed, no doubt upping the price to international standards. The Birch Memorial Clock Tower erected to the memory of JW Birch, Perak's first British Resident who was murdered. The tower tries to show more cultural sensitivity than Birch was reputed to have had. We had a great time and thoroughly enjoyed Malaysia. We recommend, as a great destination. 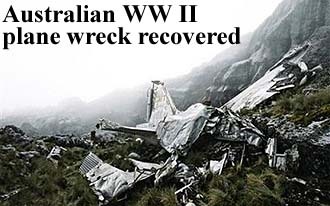 passengers and crew crashed in the Carstenz Ranges in Irian Jaya, a month after Japan surrendered at the end of World War II. The crash site was discovered by mining explorers in 1970. Last month the remains were recovered by a joint RAAF and Indonesian Air Force team which travelled to the region as part of Exercise Dakota Recovery. Personal possessions of the passengers and crew were also found. Baik was already known to various Indonesian Empires. Indeed, the Ancient Indonesian Majapahit empire raided the West Coast - What is now called Biak and the Birds head - for slaves. Biak is on the rim of Cendrawasih Bay, on an island of the same name. There are some good beaches, the most popular of which are Bosnik on the east coast which is good swimming and skydiving, and Korem on the north coast, where one can watch young men dive for pearls. Garuda have a daily flight from Bali to Biak via Makassar, dep: 1015. Was the military version of the civil Douglas DC-3 aircraft. Engine: 2 x 1100 HP Wright Cyclones or 2 x 1200 HP Pratt & Whitney Twin Wasps. Length:19.66 m. Span:28.96 m. Speed:170 knots (312 km/h). Range: 1500 NM (2500 km).